Lou Piniella is no stranger to flame-throwing relievers at the back end of his bullpens. As manager of the 1990 World Champion Cincinnati Reds, Piniella employed a trio of relievers, Norm Charlton, Rob Dibble and Randy Myers (a.k.a. the Nasty Boys), to close out games. Twenty years later, Piniella’s current club, the Chicago Cubs, are not World Series contenders, but their closer sure is nasty. Carlos Marmol is a wild man. He has amazing stuff on the mound. While he owns a fastball that averages velocity in the mid-90s, the heater only serves as a compliment to his devastatingly successful slider. Despite the above-average offerings, he has a tendency to drive Lou (and Cubs) fans absolutely insane with his control issues. Meanwhile, he tiptoes around his shaky control just enough to be wildly successful. If you looked at walk rate alone, you would think Marmol would be searching for employment rather than being the Cubs’ closer. In 43.1 innings of work this year, he’s handed out 33 free passes. That earns him a walks per nine inning (BB/9) rate of. 6.85! On the other hand, that’s a solid improvement over the 7.91 BB/9(!!) he posted last year – as Marmol walked 65 batters in 74 innings. In spite of his immensely high walk rate, and a very high batting average on balls in play (.364), Marmol has maintained a sparkling 2.91 ERA, with an even better 2.26 FIP (Fielding Independent Pitching, which strips out luck, park factors and other elements beyond strikeout, walk and home run rates). Despite allowing 1.32 base runners per inning, he is stranding 79.2% of batters who reach base. All of these statistical oddities are made possible because Carlos Marmol will strike you out. In fact, he will strike you out and the guy behind you. Marmol has struck out an unthinkable 83 batters in his 43.1 innings. Yes, he is striking out nearly two batters for every inning he pitches, 17.05 per nine innings, to be precise. If he maintains that insane pace throughout the course of the season, it would be a major league record for a reliever with a minimum of 50 innings pitched (Eric Gagne 14.98 K/9 in 2003). The high amount of strikeouts and walks have severely limited the balls in play hit against Marmol. 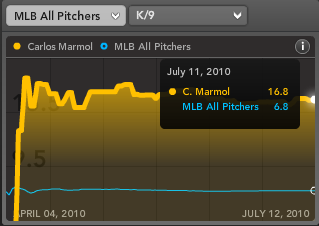 In fact, Marmol gets a swinging strike 15.3% of the time overall, and 19.6% on his slider. Because of this, the high number of walks, and high frequency of balls in play falling for hits, have not come back to haunt him. Although Marmol has been successful, this path to success isn’t blueprint for others. On the plus side, there is there is an equal chance Marmol’s BABIP regresses toward career levels (.257). Regardless, Marmol’s unique processes should continue to provide above-average results – including an astronomical strikeout rates that’s going to equal more total Ks than many starting pitchers will rack up. For more on Carlos Marmol and dominating closers, check out Bloomberg Sports’ Fantasy Kits.